Okay, so I’m not actually going to stress about the first event, because Book Blogger Appreciation Week (from the 10th to the 14th) is all about appreciating the book blogging community. It’s great for finding new blogs, discussing what we love about this little corner of the internet, and counting our blessings. My favorite part is always the interview swap. Take a look at the daily blogging topics when you have a moment. 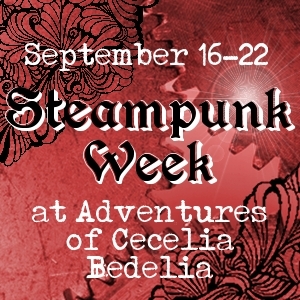 Steampunk Week in September is an event I’m hosting here at Adventures of Cecelia Bedelia from the 16th through the 22nd. I’ll be reviewing one steampunk book each day, with a couple of other fun things (and giveaways!) thrown in. If you have any interest in the genre, check it out! On September 20th, Libba Bray is doing a book signing for her newest release, The Diviners, at Politics & Prose, a sweet bookshop in DC. I will be there with bells on (not really with bells)(but it’s a great phrase, no?). Then it’s time for the National Book Festival (22nd and 23rd), which is held on the Mall. The Mall, if you were wondering, is that green strip of grass that stretches between the U.S. Capitol building and the Washington Monument. When they have a book festival on that, you know it’s serious. I love the event each year, and the lineup of authors and speakers is pretty fabulous. One of the events that will interrupt Bloggiesta weekend is KidLitCon (29th), which I’ll attend for the first time this year. Charlotte of Charlotte’s Library asked me at BEA in June if I planned on going, and I had to admit that I didn’t really know what she was talking about. Good news: it’s bloggers who love kiddie lit talking about blogging and kiddie lit, and it’s happening not so far away. I plan to take a train up to NYC and make a day trip of it (a blissful, book-friendly day!). Tell me, what events are you looking forward to in September? Is your month as full as mine? The authors appearing at the National Book Festival look terrific. Wish I could go. I'll be participating in BBAW and I hope to make it to Bloggiesta as well! 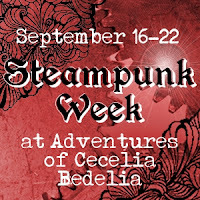 Steampunk week sounds awesome; can't wait! Definitely BBAW and Bloggiesta. Big one for me in September is Banned Books Week! September is quite busy and bookish! I'm really looking forward to the National Book Fest, too, and thanks for the reminder to check out the authors and speakers. Have to plan my day and figure out whether I'm going Saturday or Sunday... hmm. I completely forgot about BBAW this week. I didn't get signed up for any of it. funny thing is, when i saw your sentence about September being bookish, it's actually a really big month in the stamping world too... :D called "Stamptember."